Like all top artistes of his era, Sivaji Ganesan, inarguably the finest actor Tamil cinema has seen, came from a stage background. Bitten by the acting bug at an early age, Sivaji Ganesan joined Yadartham Ponnuswamy Pillai’s Madurai Sri Bala Gana Sabha, a well known Boys Company of the times. It marked the beginning of a long and cherished association with Tamil theatre, which he successfully managed to sustain even after he became a top star. That he continued to remain passionate about stage is illustrated by the fact that even at the height of his career, he continued to act in stage plays, with film shootings many a time scheduled to accommodate his stage commitments. Starting off with the Streepart (Female role) at the Sri Bala Gana Sabha, Sivaji Ganesan’s repertoire expanded to a wide range of roles, all of which stood him in good stead when he made his foray into films. In his autobiography “Enathu Suyasarithai”, he poignantly recalls the struggles associated with life in a Boys Company, where they would often be confronted by poverty and other tough circumstances. Parasakthi (1952) propelled him to stardom, after which there was no looking back for him as a film star. His passion for stage was however undiminished and he performed for troupes such as S.V.Sahasranamam’s Seva Stage. He started Sivaji Nataka Mandram in the mid-1950s to continue his passion for stage and also to provide opportunities to many actors who were trying to make it big in films and were languishing for roles. Managing the troupe was S.A.Kannan, a stage actor who was part of the Sakthi Nadaga Sabha that had just then wound up. Sivaji Nataka Manram over the course of the next couple of decades went on to produce several hits on stage which would also replicate the success on celluloid when they were remade. 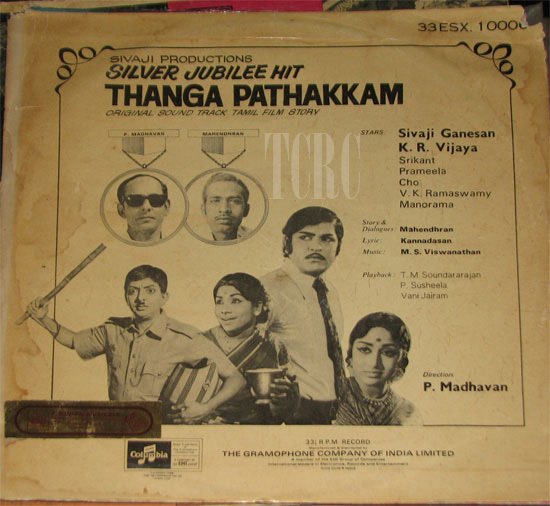 Famous plays included Veerapandiya Kattabomman, Vietnam Veedu, Needhiyin Nizhal, Pagal Nila, Kaalam Kanda Kavignan and Thanga Padhakkam, the subject of this piece. In his autobiography, Sivaji Ganesan says that the play, written by J.Mahendran (later of Mullum Malarum fame) was originally being staged by Senthamarai. He watched the play at the Raja Annamalai Mandram and highly impressed by it, asked Senthamarai for the rights to stage it under the Sivaji Nataka Mandram banner and also make it into a movie. Senthamarai agreed and Sivaji Nataka Mandram inaugurated the play in 1972. 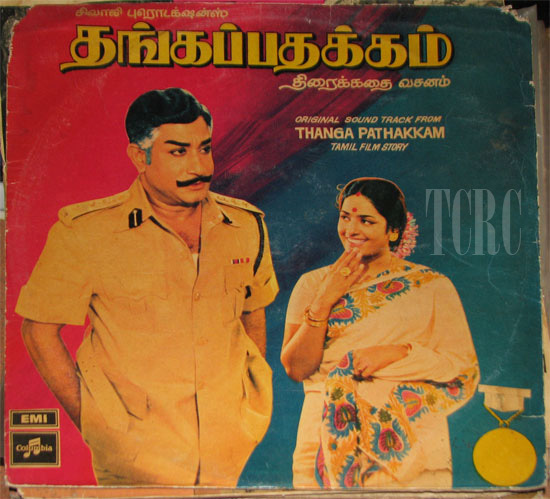 The play, which revolved around an upright police officer, Superintendent of Police (S.P) Chowdhry was directed by S.A.Kannan and had Sivaji Ganesan playing the main role. Others in the cast were Sivakami (who played his wife, the role played by K.R.Vijaya in the film) and Rajapandian, who donned the role of his son Jagannathan (Srikanth playing the role in the film). The Kalki magazine review of the play makes special mention of a sequence where Sivaji Ganesan sings and dances merrily in the birthday party of his son, hailing it as a novel attempt. Reviewing Sivaji Ganesan’s performance, it says that calling his acting a majestic portrayal would be akin to saying sugar is sweet! The play was made into a movie in 1974. P.Madhavan, who directed many hits (including some with Sivaji Ganesan) directed this movie, which was produced by Sivaji Ganesan’s daughter Shanti Narayanswamy for Sivaji Productions. The movie was a great success. The characterisation of the Superintendent of Police became a sort of a benchmark, with many a later movie referring to Chowdhry when mentioning a honest and upright officer! Below are the images of the LP from this film pulled out from our archive. This entry was posted in From Stage to celluloid, Tamil Cinema, Theater and tagged archive, Arts and Entertainment, Asia, Chennai, Chowdhry, cinema, Cinema of India, cinemas of india, Enathu Suyasarithai, film, Film Appreciation, Film Criticism, film history, film memorabilia, Filmmaking, India, Indian cinema, J.Mahendran, Jagannathan, K R Vijaya, Kalki, LP record, madras, memorabilia, Movies, P.Madhavan, Parasakthi, Rajapandian, S.A.Kannan, S.V.Sahasranamam’s Seva Stage, Sakthi Nadaga Sabha, Senthamarai, Shanti Narayanswamy, Sivaji Ganesan, Sivaji Nataka Mandram, Sri Bala Gana Sabha, tamil, Tamil cinema, Tamil Nadu, tamil theater, TCRC, theater, Yadartham Ponnuswamy Pillai. Bookmark the permalink.